In Advance Concrete, to adjust drawings and layouts to the standards of your design office, you have the option to create user-defined symbols for cut views and elevation arrows. 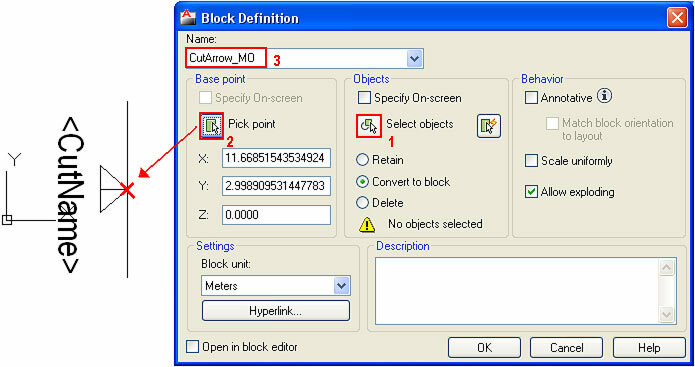 The following steps demonstrate the creation of a user-defined symbol for cut views. Using the same process, you can create user-defined symbols for elevations. Load the existing block "Cut arrow" and explode it. The < Cutname > attribute is necessary for correctly naming the cut view. It labels the cut view according to its definition settings. Create a user-defined symbol using AutoCAD tools (Line, Circle, Hatch etc.). Delete, if necessary, elements of the existing symbols. You can place the annotation text for the new symbol. Create a block starting from the AutoCAD elements. 1. Select all objects that belong to the new symbol. 2. Define the base point. 3. Insert a name for the new block. The cut line representation is defined using a dimension style. 1. Open the dialog for the creation of a new dimension style. 2. Enter a name for the new style and select "GrCut" as the template. In the "Modify dimension style" dialog box, on the "Lines and arrows" tab, select > User-defined arrow...< for "Arrowhead1". In the following dialog box, select the newly created symbol block. The selection is automatically applied for "Arrowhead2" (If not, then repeat the selection for the second arrowhead). Confirm the modifications with "OK" and close the dimension style manager. Select the "Create a cut" and open the "Properties..." dialog box. 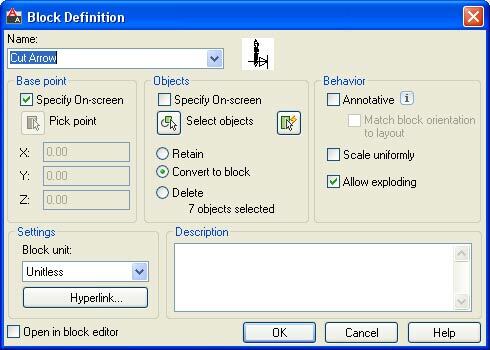 In the following dialog box select the newly created dimension style as arrow style. You can also apply the new dimension style to the cut lines of the existing cut views.